Some experts argue states such as Tajikistan and Turkmenistan would be unable to contain a hypothetical breakout of fighting in Afghanistan's fractious northern provinces without significant outside help. There is ground to believe the militants long-term plans may include invasion of Turkmenistan. «Galkynysh» or Southern Yoloten-Osman, Minara fields eastern part of the country, as well as gas deposits in the adjacent areas making one giant oil field – the second largest in the world. Another lucrative objective is obviously the Amu Darya River with the Bagtyyarlyk gas deposit on its left shore. The Turkmenistan border guards can see with their own eyes the fighting raging on the Afghan side of the border. Until now the Taliban has held its positions making the TAPI construction impossible. 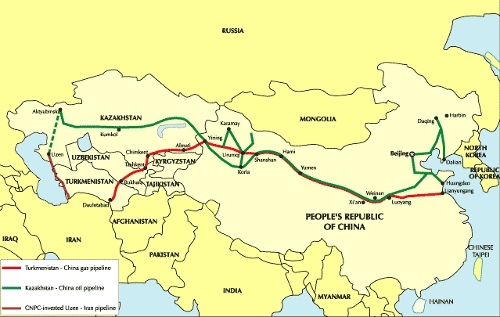 The ANSF attacks prevent militants from invading Turkmenistan, but they use the tactics of raids to scare foreign investors away and make them withdraw from gas projects, like TAPI, the Turkmenistan-Uzbekistan - Kazakhstan - China (TUKC) pipeline and the Trans-Caspian Gas Pipeline. Local extremists are likely to join the fray as it starts. The use of armed jeeps (the tactics tried in Libya) may be successful in case it’s not countered by helicopters that hardly anyone else but Russia could provide in needed numbers. The other weak point to make Turkmenistan vulnerable is water security. The militants control the district of Hamyab, Jowzjan province, bordering Turkmenistan. Actually, the radicals are just four-eight kilometers away from the Karakum Canal which is crucial for the country’s water supplies. The canal goes straight to the Caspian Sea. Creating obstacles on the way of riverine traffic is a great threat. Snipers are already at work. The Amu Darya and Turkmen border guards are the only obstacle on the way of moving to Turkmenistan. Now to another country facing an invasion threat. There are the following scenarios of potential invasion of Tajikistan: attacking the city of Khorog in the West-central Gorno-Badakhshan mountainous region, launching an offensive to seize Kurghan Tube and Sambuli military range, the Khatlon province, or clandestinely moving forces from Takhar province in Afghanistan to Tajik cities of Tavildara and Gharm along the border with mountainous Badakhshan to finally enter Kyrgyzstan. Badakhshan is the weakest point - the area is flooded with criminal gangs ready to join the forces opposing the government in Dushanbe. True, the US aid can lend a helping hand. As the Iraq and Afghanistan experience shows, there is each and every ground to believe it won’t be effective. By and large, it will all boil down to consultations, providing limited funds, personnel training programs. The supposition that America may be seriously involved in the events sounds more a wishful thinking. Anyway, the US will avoid any decisions till the president – elect will take office on January 20, 2017 – and that’s a long time to go. China is mainly concerned over the stability of energy supplies and economic prospects. It could make a significant economic and political contribution, but the situation is not viewed by Beijing as an imminent security threat. The situation is an imminent threat to Russia with its many centuries-long history of living together with Central Asian nations. Unlike the US or the EU, Central Asia is close to Russian borders, and there is a plethora of common interests to unite Moscow with the states of the region. Unlike the West, Russia never imposed its vision of democracy and human rights protection. Common security concerns have produced the Collective Security Treaty Organization (CSTO), an organization with teeth serving as an instrument to safeguard peace and stability in Central Asia. The organization is an intergovernmental military alliance formed in 1992 with six members at present: Russia, Tajikistan, Kazakhstan, Kyrgyzstan, Armenia and Belarus, as well as two observer states – Afghanistan and Serbia. Its rapid reaction force was established in 2009 to counter a limited military aggression against CSTO members, as well as to combat terrorism and drug trafficking. This is the only real force to counter the common threat and it is ready to accomplish the mission. The uptick in Afghan fighting has given rise to concern of Russia’s allies in Central Asia and they look towards Moscow for reassurance. For instance, Tajikistan hosts a Russian military base and has called for Moscow to step up its military assistance to the country. This May Russia deployed hundreds of troops bolstered by soldiers of brotherly nations from Tajikistan, Kazakhstan, Kyrgyzstan, Armenia and Belarus for drills in Tajikistan to hone skills of conducting joint combined rapid deployment operations. All in all, the exercise involved more than 2,500 troops, 200 units of armaments and military equipment, about 20 combat aircraft and helicopters and 30 military transport aircraft. The move demonstrated the readiness of Russia and CSTO allies to match the words with deeds and guarantee the region's security after US troops leave Afghanistan.